Geneva, October 1, 2018: Internal Affairs Minister Honorable Varney A. Sirleaf is in Geneva, Switzerland to attend the 69th Session of the United Nations High Commission for Refugees (UNHCR). 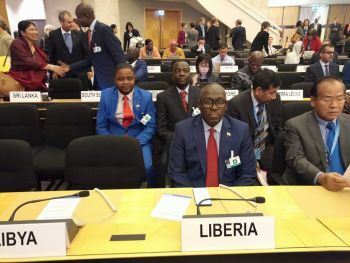 The Minister who chairs the Board of the Liberia Refugee Repatriation and Resettlement Commission (LRRRC) is attending UNHCR General Assembly along with the Executive Director of the LRRRC Honorable Festus Logan. The Minister is expected to deliver a statement on behalf of the Liberian Government on issues related to refugee situations in Liberia. This comes in the wake of massive repatriation of Liberians believed to be migrants who are being transported to Liberia. Also the welfare of refugees of Ivory Coast and Sierra Leone etc. Details will follow as they unfolds.